If you’ve been searching for an alternative to rice and pasta so you can fuel your body, then Quinoa may just be the answer. 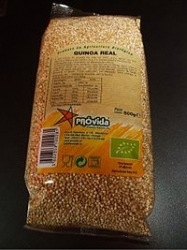 This grain which is somewhat native to South america looks somewhat like couscous, and can be cooked like rice. With a high percentage of complex carbohydrates, and no vitamin K, Quinoa is the perfect food to supply your body with usable energy and not trigger arm pump. Exceeding 125 mcg of vitamin K each day can contribute to changes in blood viscosity, that may trigger arm pump in action sports athletes. One of our Motocross Pros Liam O’Farrell swears by Quinoa, so we incorporated it into his daily diet as he prepares for the upcoming 2012 outdoor nationals. One look at the nutritional information below, and you’ll see why it may be the perfect performance carb for demanding action sports athletes. Give Quinoa a try sometime in place of your usual potato, rice or pasta, ans se exactly how it can hlp fuel your body for maximum performance.